Cabin Fervor: Deals and Steals: Kitchen Sink? Deals and Steals: Kitchen Sink? We went to a HUGE architectural salvage yard in Baltimore on Saturday called Second Chance. The many and extreme wonders of this place shall be saved for another post... but for now let's suffice it to say that it had everything, including the kitchen sink. (Was that lame?) Anyway, barring divine intervention, Saturday's trip definitely won't be our last. 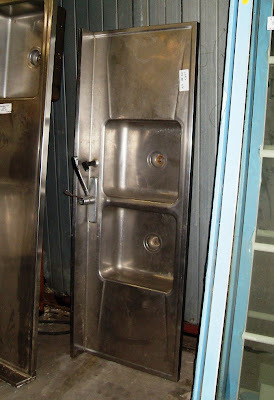 We went in search of my marble slab, but we ended up impluse-buying this very old, very dirty (but in otherwise great condition) 6' prep sink for $165. This is a drastic cost savings over buying a new one... and to be honest I actually like the fact that it's a little retro. There's not even a single dent or ding, and some elbow grease should clean it right up. There are two barriers preventing it from being perfect --1) the basins are a bit shallower than we really wanted, and 2) there is no base with it. However, we're thinking we could always install it now, then either sell it on Craigslist or install it in the future garage "workshop" if we don't like it in the kitchen. Swapping it out for a new one down the road won't affect the plumbing in any way. So, check the sink off the shopping list, at least for now. We're getting there, peeps. Getting there. Nice find. There's a place in Indianapolis simular to the one discribe but the prices were out-of-sight! You got a steal on that steel. Steal on the steel? Between your jokes and mine, I guess it's cheap humor week here at Thirtyeight20!